DEAR MAYO CLINIC: Based on my snoring and from everything I’ve read, I think I may have sleep apnea. But I don’t want to spend a night at the hospital for sleep testing. Is there an easier way to know if I have sleep apnea? Can I somehow test for it at home? ANSWER: A diagnosis of sleep apnea usually does require a sleep study, but that test doesn’t always have to be in a hospital or other health care facility. Home tests often are recommended for people suspected to have sleep apnea. Sleep apnea is a condition in which people repeatedly stop breathing during sleep. There are two main types of sleep apnea. 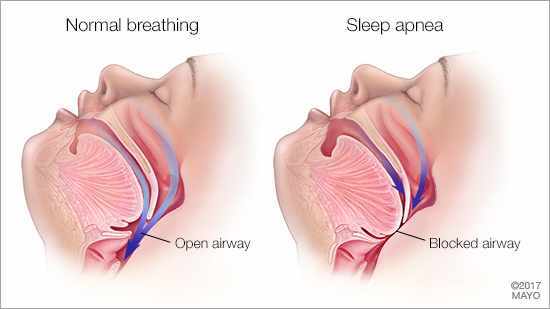 The more common form is obstructive sleep apnea, or OSA. It happens when muscles in the back of the throat relax, narrowing the airway and making it hard to take in enough air. Central sleep apnea is less common. It happens when the brain doesn’t send the proper signals to the muscles that control breathing. The most obvious signs of obstructive sleep apnea usually are noticed by a bed partner. They include loud snoring, episodes of stopped breathing during sleep, and abrupt awakenings during the night accompanied by gasping or choking. Other common symptoms include excessive daytime sleepiness; waking with a headache, dry mouth or sore throat in the morning; and difficulty concentrating during the day. Anyone can have obstructive sleep apnea, but it most commonly affects older adults, men and people who are overweight. Your health care provider can conduct a preliminary evaluation of your condition by reviewing your medical history, discussing your symptoms and performing a physical exam. But sleep apnea cannot be diagnosed based on those factors alone. Monitoring you during sleep is required for a definitive sleep apnea diagnosis. For most people suspected to have obstructive sleep apnea who are otherwise healthy, a home sleep apnea test can be a first-line option to distinguish obstructive sleep apnea from snoring alone. A home test may not be appropriate, however, for people who have significant heart or lung problems, or for those who have neurologic disease. In addition to not requiring an overnight stay in a medical facility, a home sleep apnea test is typically more comfortable and less intimidating than a laboratory-based sleep study, and it usually involves fewer sensors. The portable monitoring devices used for home tests generally measure heart rate, blood oxygen level, airflow and breathing patterns during sleep. If you have sleep apnea, the test results will show drops in your oxygen level when you stop breathing, followed by a rise in that level when you wake. If results of a home sleep apnea test are negative, your health care provider still may recommend a lab-based study to confirm that result, as it’s possible for home tests to miss some cases of obstructive sleep apnea. The lab-based test is called nocturnal polysomnography. During that test, you’re hooked up to equipment that tracks your heart, lung and brain activity; breathing patterns; arm and leg movements; and blood oxygen levels while you sleep. A technician monitors you throughout the test. Nocturnal polysomnography can help your health care provider definitively diagnose obstructive sleep apnea. It also can help rule out other sleep disorders, such as periodic limb movements of sleep or narcolepsy, which may cause daytime sleepiness and other symptoms similar to obstructive sleep apnea but require different treatment.